Sachin Tendulkar is on a different planet. Like Usain Bolt he’s left the competition to settle matters between themselves as he blazes ahead. Can we please have a bold 80-point newspaper headline saying ‘He Bats On’? Three lengthy breaks from cricket and two career-threatening injuries that needed surgeries are now years behind him and bowlers around the world are paying for the period where he was vulnerable, scratchy and out of sorts. Tendulkar has been single-minded in his pursuit of excellence and in the past few seasons he’s looked like getting a big score almost every innings. From January 2008 there has been just one series in Sri Lanka—and a solitary Test against South Africa before that—where he hasn’t got to a three figure score and he’s scored one or more hundreds in all the other nine Test series’ that India has played since then. Tendulkar has always been reluctant to take a runner as the single is a vital part of his batting and he has said it more than once that only he knows the speed with which he has played the ball and also whether he’s played it to the right or the left of the fielder. He judges a single to perfection. Opposition captains have said that on some days they know they are up against it when Tendulkar is scampering for quick singles and is alive to any possibility of an extra run. During India’s 2007-08 tour of Australia Peter Roebuck in an article for the Sydney Morning Herald also wrote about Tendulkar’s mastery of pinching a run and it came pretty-close to defining how Tendulkar approaches a Test innings in his new enlightened avatar. “Among modern batsmen, Sachin Tendulkar is the master of the single. In some respects, it is not much of a claim. It’s a bit like saying Roger Federer has the best ball toss around. Tendulkar has many other more colourful qualities: a blistering straight drive, a cart that is liable to land in the fifth row, a square cut that singes the turf, a fine sweep and a defensive stroke played with a sculptured left elbow. A mere 2.8 per cent of Tendulkar’s Test dismissals have been a result of a run out—out of the 250 times he’s been dismissed in 280 innings just 7 have been run outs. And if one is feeling fair then half of them can be said to be his mistakes and the other half that of the partner and we can give an odd one to an exceptional bit of work in the field; which leaves you with three badly-judged runs in a Test career spanning 21 years. The single also has other fascinating aspects to it. What it does to discourage the bowler is another story and a different side of the coin is what it does for Tendulkar in the middle. A four from the first ball can be the result of having been offered a gift first-up or a brilliant ball that goes for a streaky boundary. Neither of it does anything remarkable for Tendulkar’s confidence. On the contrary, a well-played-and-placed single reveals to Tendulkar the speed at which the ball is coming off the deck—unless it is a full toss—the bounce in the wicket and his own timing. A couple of singles and watching a few balls from the other end are enough for the Master to assess the conditions and he is up and running. In this watchful initial period he makes the adjustments and decides the strokes for the day and also those to be kept in his back pocket for some other day. The day he got his and the 50-over format’s first double hundred (unbeaten) against South Africa he got the strike on the third ball of the first over by Dale Steyn. Sehwag had just got a reprieve as Steyn failed to latch on to a tough chance and a single followed. The next four balls of Steyn were all on a good length and he was getting the ball to shape away from the right hander. All four balls found the middle of Tendulkar’s bat, who played them off the front foot in the region between cover and the bowler for no runs. Playing four balls and watching four from the other end and he was set. He fetched 15 runs from the next six balls that he faced and the rollicking show started. This is from an earlier piece of mine on how he started his innings at the Eden Gardens against South Africa when he got back-to-back Test hundreds: Tendulkar joined Sehwag and tapped the first ball he played, a 147 kph full delivery outside off from Morkel, to point for a single. That was the beginning of an assured partnership in which Tendulkar gave another display of his class and his mastery. He played the ball with that natural and intriguing intimacy that he has displayed in the last few seasons. He was solid in defence and gave no bowler even a hint of a chance. It was just beautiful batting. I am leaving the single for now to look at the stratosphere that Tendulkar has made his home in the last three seasons or so. Just in order to have a frame of reference and make a comparison we can look at the other modern batting giant Ricky Ponting. On December 26, 2007 India squared up against Australia in the Boxing Day Test in Melbourne and began their long tour of four Test matches to be followed by the last edition of the traditional tri-nation ODI series—the Commonwealth Bank Series. Ricky Ponting and Sachin Tendulkar came to this series having had very contrasting two years prior to this much-awaited Test rivalry. Ponting was peeling centuries from 2005 to 2007 and perhaps had the greatest run by a batsman in the modern era. Three times in this period Ponting made a hundred in each innings of a Test and overall in 28 Test matches he made 13 hundreds and 12 fifties at a phenomenal average of 74.68. Sachin Tendulkar had a miserable period in which he had two surgeries, made comebacks to the playing XI after lengthy breaks, and was even booed by his home crowd at the Wankhede Stadium in Mumbai against England, when he got out, ironically in the context of this piece, having scored just a single off 21 balls. In 22 Test matches in this period he made three hundreds and nine fifties at a modest average of 42.72. Two of his hundreds came against Test minnows Bangladesh and one against Sri Lanka in New Delhi. On that day in Melbourne the bowlers did well but in the course of the Test match the batting let the team down and India lost the match by a massive 337 runs. 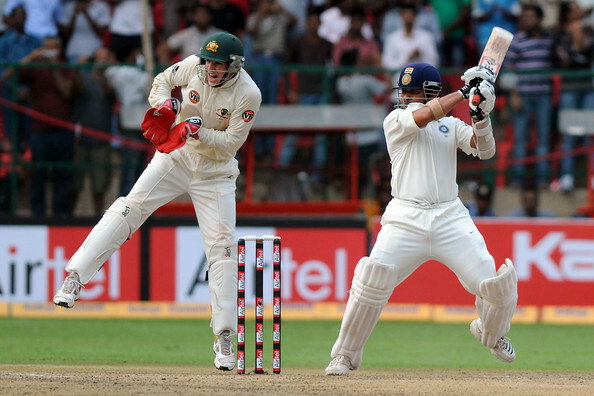 Tendulkar made an attacking 62 in the first innings of that Boxing Day Test and Brett Lee got him on 15 in the second. Ricky Ponting failed in both innings making 4 and 3 runs. At the end of the Test match Ponting had 9515 runs at an average of 58.73 with 33 hundreds and 38 fifties in 113 Tests. 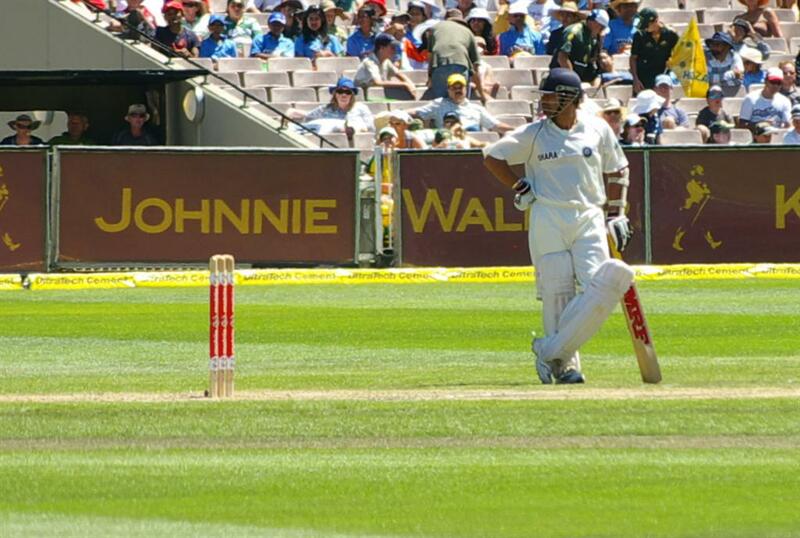 Tendulkar after that Test had 11366 runs at an average of 54.90 with 37 hundreds and 48 fifties in 143 Tests. Ponting’s exceptional period of the past few years and Tendulkar’s miserable run during the same time had narrowed what seemed like an unbridgeable gap till the end of 2002. In November 2002, Tendulkar was 19 hundreds clear of Ponting and in the period that followed and established Ponting as a modern great he made 21 hundreds as opposed to Tendulkar’s four and the gap narrowed down to just two after Ponting scored successive centuries at Brisbane and Adelaide in the 2006 Ashes in Australia. That was the closest that Ponting came as Tendulkar was about to embark on another streak of brilliance. A brilliance as captivating as his majestic and dominating batting in the 1990s—for some, and I am one of them, this period has been even more satisfying than his demolition of bowlers in his heydays. This is Tendulkar the batting Buddha; a Tendulkar as close to perfection as an ascetic blessed with benediction after decades of rigorous and loving pursuit of the Lord. From December 26, 2007 Ponting has played 36 Test matches (65 innings) and made 2742 runs at an average of 42.84 with six hundreds and 17 fifties. And from the same starting point Tendulkar has played 29 Test matches (51 innings) for 2951 runs at an average of 65.57 with 12 hundreds and 11 fifties. The overall batting record for Ponting now stands at 12250 runs in 148 Test matches at 54.68 with 39 hundreds and 55 fifties. For Tendulkar it is 14240 runs in 171 matches at 56.96 with 49 hundreds and 58 fifties. So despite playing seven Tests (14 innings) less than Ponting the Master has still surgically opened up the gap. In the ODIs there is no comparison as Tendulkar has been phenomenal and has played some career-defining innings. The first-and-only double hundred in a limited over game, a brilliant match-winning hundred while chasing in a final in Sydney and a 138 to win a tournament final in Sri Lanka. The magnificent 175 in a losing cause against Australia and a 160 plus in New Zealand are some of the highlights of his performance. Overall Tendulkar in 442 ODI matches has made 17598 runs at 45.12 with 46 hundreds and 93 fifties. Ponting in 351 matches has 13072 runs at 42.85 with 29 hundreds and 79 fifties. Tendulkar is busy ensuring that only the name of Sir Donald Bradman be taken in the same breath as his. And even there more and more former cricket greats are now handing over the title of the greatest batsman of all times to Tendulkar; as apart from the Don’s staggering Test average Tendulkar is head-and-shoulders above the legendary Australian in many other significant ways. The Boy from Bandra is more than a match for the Boy from Bowral. Sachin Tendulkar is his own competition and it seems like he is quite unmindful of the fact that his business is the intrinsically-competitive arena of international sports. He keeps pushing his limits to come up with goods that no one else seems to be trading in. Yesterday he scaled a peak higher than the Mount Everest. A peak that did not exist before he set out to conquer it in the afternoon of February 24, 2010; just two months shy of his 37th birthday on April 24—and 22 years after he had shared that record partnership of over 600 runs that brought two schoolboys to the forefront. Would Neville Cardus have called this Little Master ‘A devastating rarity: A genius with an eye for business?’ I presume he would have said something even greater as Tendulkar apart from being the efficient and consistent run-maker is also a classically-beautiful player to watch. He is efficient like a well-oiled and calibrated machine; only that no machine can be so joyous or can spread so much joy as the Little Master. He dedicated his innings to you and me; to the fans saying that their support was crucial during days when there was no rain. His adaptability puts him way above any batsman who has ever played the game. The only comparison that makes some sense is with the great Sir Donald Bradman, who played just one form of the game and more importantly played his cricket in just nine grounds against four oppositions. Tendulkar, as I had mentioned in an article before, played on 32 different surfaces before he first played a Test on a ground where he had played a game before. One would have to seriously devote an hour or two to count all the various grounds where he has played Test or One Day International innings. On top of that he has also had to live the life of a man who can’t pass through anywhere in India without everything going berserk. Tendulkar can’t go and hang around in one of his businesses on the eve of a Test match. Hell, he can’t even drive a car in his home country or go for a casual walk in any part of India. I can say it with certainty that if he lands up in a quiet hamlet like Dalhousie, the residents of the hills having a devil-may-care attitude would all congregate in the small and tidy Mall of the remote hill station to mob this phenomenally-loved son of the Indian soil. And I mean the old grandmas as well. He adapts to alien situations and surfaces as if they were his backyard and is completely at ease with two diametrically-different forms of the game: 47 hundreds in Test matches and 46 in limited overs. With the kind of form he was suffering from around the injury years during the middle part of the decade that has just gone, it is an astonishing achievement that his Test match hundreds have caught up and then gone ahead of his ODI tally—the ODI numbers were much higher a few years ago. Yesterday he made an unbeaten double hundred in a 50-over match against a very good South African attack on a surface that was good for batting. He got the strike on the third ball of the first over that Dale Steyn bowled and he played the first four balls that were shaping away right from the middle of the bat for no runs. One run came from that ideal first over where Steyn could not hold on to a tough chance that Sehwag gave on the second ball of the over. Tendulkar took the first four balls to play himself in and then he hit two gorgeous fours off Parnell in the second over and then another one to Steyn in the third over and the rollicking show started. The BBC said: Tendulkar, whose previous best one-day knock was the 186 not out that he scored against New Zealand in 1999, is already the leading run-scorer in Test and ODI cricket. But to have reached such a landmark, with a single in the final over, only serves to underline his class and add to the legacy that already surrounds arguably the finest batsman to have played the game. Tendulkar raised his 100 in 90 balls with the help of 13 fours; all of them odd in the sense that each one of them stood out as a perfect stroke. In his last two Test matches Tendulkar got hundreds against South Africa but got out shortly after that but here there was no letting up. Immediately after getting to a hundred he pulled Kallis for a four and then smashed one straight over the bowler’s head that went like a projectile. Then he took care of Duminy by stepping out to get his first six and drilled a four again over the bowler’s head. Karthik played a wonderful hand and was gone in the 34th over having made a very fluent 79. In walked Yusuf Pathan and he negotiated Parnell’s over safely but without adding to the scoreboard. India took the batting powerplay and South Africa brought back Steyn for the 35th over. Steyn bowled full and outside the off stump and Tendulkar had to stretch to reach. The second ball had been dispatched to the boundary and Tendulkar missed the third and the fourth but he changed his plan for the fifth ball and walked across to the offside to flick the full ball between square-leg and mid-wicket. This is the order in which the runs came in the five power-play overs: 9, 8, 17, 18, 11. In five overs 63 runs were made and Pathan went from zero to 29 and Tendulkar added 33 to go up to 157 and there was a wide. Then there was a sensational partnership of 101 in 8.5 overs and the only one of the innings that Tendulkar did not dominate in terms of runs as Dhoni shredded the attack. He was cramping a bit but he summoned the energy to reach the summit. He just simply loves doing it; his passion and love for the game makes it possible. The genius is constantly learning and is always working on his game. In the last tour to Australia when he scored a hundred in the Sydney Test he was asked in the post-day interview about the jinx of 90s that had plagued him throughout the previous year. Tendulkar said ‘I was getting into bad habits and I needed to break them this year’. Simply brilliant. Since that day Tendulkar has made 8 Test match hundreds and 5 One Day International hundreds. The ODI hundreds were all hailed as one of his best until he went on to upstage them; the 117 not out he made while chasing in the first Commonwealth Bank Series final in Sydney, the 163 retired hurt he made in Christchurch where he could have got a double but he took the decision to not take a chance with a niggle before the Test series. The 138 in a final against Sri Lanka in Colombo was another match-winning knock; and then that tremendous 175 that could not see his side home but was hailed as his best-ever hundred coming under the pressure of chasing 350. Now he’s got the first double hundred in an ODI; an unbeaten 200 against a good attack. The last word must go to one fresh and insightful voice in the commentary box; that of former England captain Naseer Hussain: “I have never quite liked comparisons between great players, but after Wednesday’s game it must be said—Sachin Tendulkar is the greatest batsman of all time.